Keep track of your gear, in your pocket. This simple little tool lets you store information about your devices in a very flexible database. Becomes a quick resource and keeps track of any range of information. The app keeps track of the location, serial numbers, hardware specs, warranty info and more. You can carry the information with you as you travel around your workplace, in your pocket on the iPod, iPhone or in your bag on your iPad. Your equipment can be grouped by location. Eg, Office, mome, warehouse #1, etc. 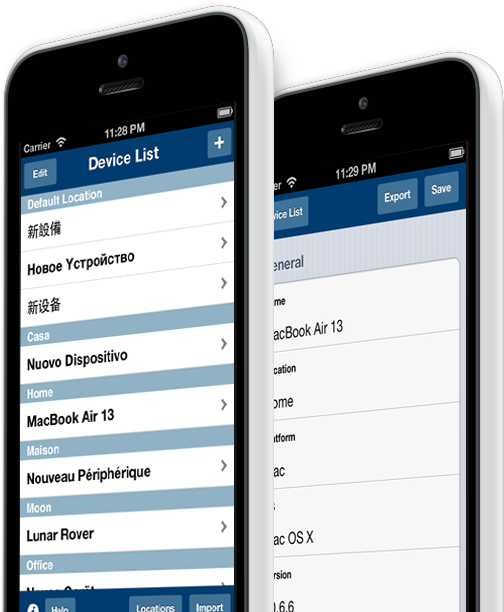 Built in import and export of records, so you can easily share info between your iPhone & iPad, or even with a co-worker. By email or iTunes. You can add multiple photos to a single record. The application works in English, French, German, Spanish, Italian, Russian, Japanese and Chinese. Checkout our 30 second overview and learn more about our app. Very descriptive and detailed. Like the ability to add a picture. Would like to have some type of on-line or cloud capability to sync and store-that would make it perfect. Otherwise, I hate to put all the information in for my items, then get my iPad or iPhone stolen. All that work will have been for nothing. Otherwise, I think this is a good start. Die Software macht was sie soll... Nutze die Software für Bautrocknungsgeräte die bei uns von Kunde zu Kunde wandern. Eine Übersicht welches Gerät wann aufgestellt wurde wäre auch nicht schlecht. Ebenso vermisse ich die Funktion alle Geräte inclusive. Standort in einem Zuge zu Papier zu bringen. Alles in allem bisher zwar für mich zu viele Felder aber eine funktionsfähige Software. Good ap so far great potential for it repair. Need to be able to group items under a company or client using contacts. Eg Freds school 40 computers also record passwords an logins for vnc or teamviewer etc. Awesome app. Very close to what I was looking for. It would be nice if it concentrated on devices, and not just computers, and had upgrade due dates. Other then that. Very cool and useful. Sorry to keep you waiting. We’re pretty sure you got borred by now. To make things up for you, just the button below.